What are you ‘entrepreneurial’ about? “Everybody is entrepreneurial, they just need something to be entrepreneurial about. Entrepreneurship is owning whatever role you are in,” said Ryan Porter, founder of Going 180 Media and Raise Your Flag, as we sat in the café of the MaRS Collaboration Centre. After listening to him speak about his own journey and experience, I knew Ryan had found his reason for being entrepreneurial. The question I pose to you is: Have you found your reason to be entrepreneurial? If not, a few insights from Ryan’s experience might help to stimulate some thought. Ryan hated college. He viewed it as a glorified version of high school; he found that it wasn’t really challenging, taught dumbed-down information and had a million ways to game the system. Does that sound familiar? Some of this may resonate with you and is in part the inspiration behind Raise Your Flag, a startup that connects students with companies who are interested in hiring them for entry-level positions that don’t require a degree. Ryan started Raise Your Flag after college, inspired by conversations he’d had with people who had lived a variety of experiences. While working with his mom on a project focused on helping students transition from university to the work world, Ryan ended up talking to a student who decided he didn’t want to go to university. That conversation led him to a stream of speaking engagements, with audiences as large as 6,000 students. 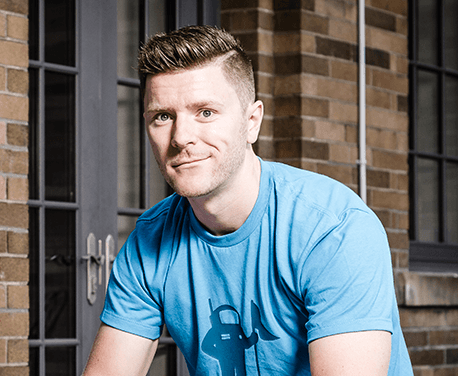 Ryan owned his role in impacting students’ lives; to date he has addressed more than 950,000 students across Canada, as well as high school groups in the US. This is part of what has led Ryan into entrepreneurship and kept him there—his ability to impact the lives of young people who are unsure of their next step or of the options before them. If you think they are only a handful of the student population, think again. A whopping 45% of students in the U.S. don’t go to college or university. What are these young people doing? They are contributing to society just like everyone else, but sometimes in roles that are unconventional or that aren’t given much consideration because they are also very specific. For example, in Tokyo Ryan met a young woman who spotted schools of sharks for a living. This seemingly random career path is not random at all, but simply not one of the conventional options presented to young people considering paths to take. Of one student who chose to not go to college or university, he said, “Michael deserves to be just as excited [about the next step in his career] as a high-school student opening an acceptance letter for university.” These are the people that Ryan draws inspiration from—the ones who are entrepreneurial by virtue of having passionately cut their own path, despite it being unconventional. These are the entrepreneurial minds that Ryan’s organization Raise Your Flag serves. He compares them to the Wright Brothers: young people who may be working on something unpopular or uncelebrated, that people only pay attention to because they anticipate the project will crash and burn. The entrepreneurs that Ryan celebrates are the ones who don’t wait to find passion like a $10 bill forgotten in a coat pocket, but who actively work to discover it and cultivate it, learn from what they are doing and apply that learning to whatever they do. One example of this sort of entrepreneur is Emily Branton, who will be one of Ryan’s co-panellists for the upcoming Entrepreneurship 101 Meet the Entrepreneurs – Social Innovation panel discussion on November 12. Join us to hear more about Ryan and Emily’s insights from their entrepreneurial journeys. In the interim, think about how you can cultivate passion, what role you can own and what it is that makes you entrepreneurial. Good luck and happy hunting!